Galderma is a large multinational pharmaceutical company. They don’t have much in the way of internet blogs and online chatter so it is hard to get a feel for what makes them tick. In recent years Galderma has become the heavyweight of dermatology, especially in rosacea treatments. The program list from the recent AAD meeting in Florida gives an idea of where Galderma are concentrating their promotional efforts. You can see that Galderma is far and away the most prominent advertiser. Many won’t have seen these advertisements, so here we are, a snapshot of the sorts of marketing material that Galderma is using to target practitioners. In the handouts each prescription product is normally accompanied by a second page comprising the mandatory prescribing information. Oracea is promoted as a `direction’ that is a `Power Change for the Journey Ahead’. 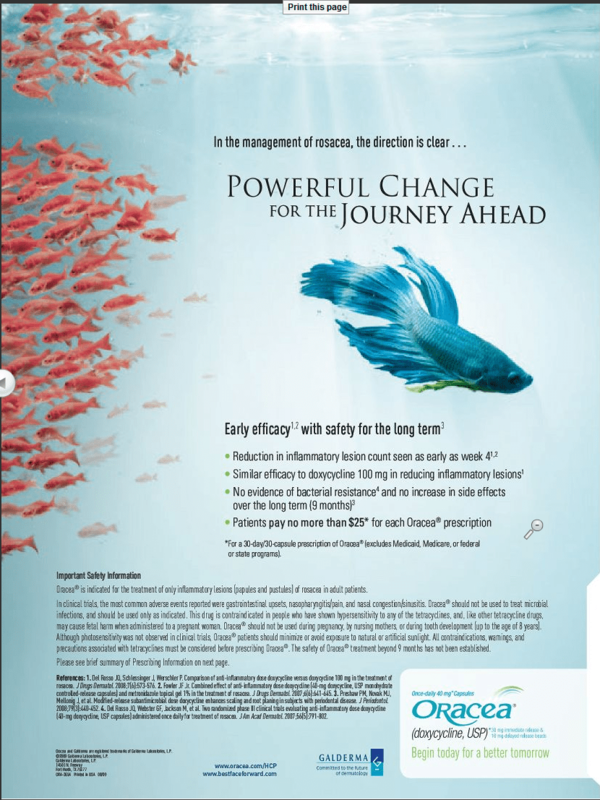 The advertisement is highlighting the low incidence of side effects, a similar efficacy to 100mg doxycycline and a reduction in lesions in as little as 4 weeks. Using words like journey and `better tomorrow’ and mentioning that no side effects were seen in 9 months suggests that Oracea is seen as a long term prescription. Oracea has been earned marketing awards in the past. 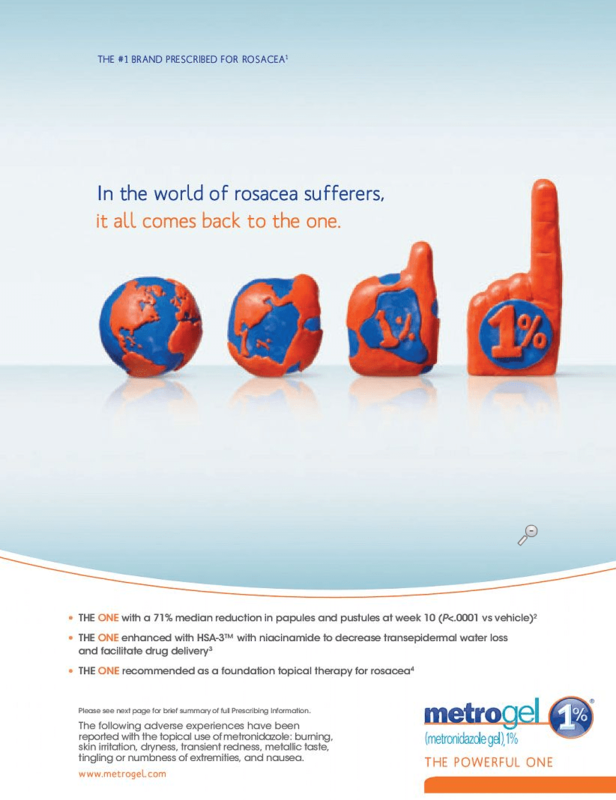 In September 2009 we learnt that Oracea is worth $104m a year. Tagline: In the world of rosacea sufferers, it all comes back to the one. 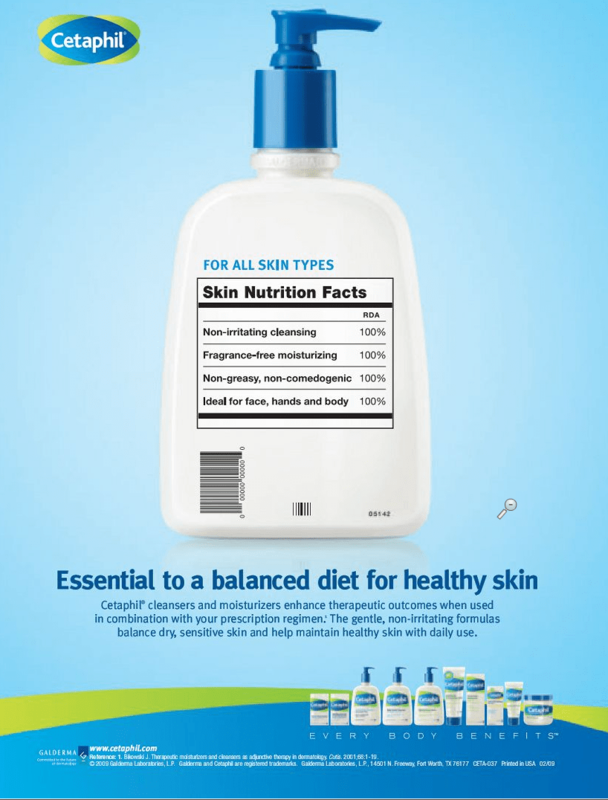 Tagline: Essential for a balanced diet for healthy skin. and Every Body Benefits. Galderma here are promoting what it sees as a non-irritating cleanser, fragrance-free moisturizer, being non-greasy and non-comedogenic and being ideal for face, hands and body. 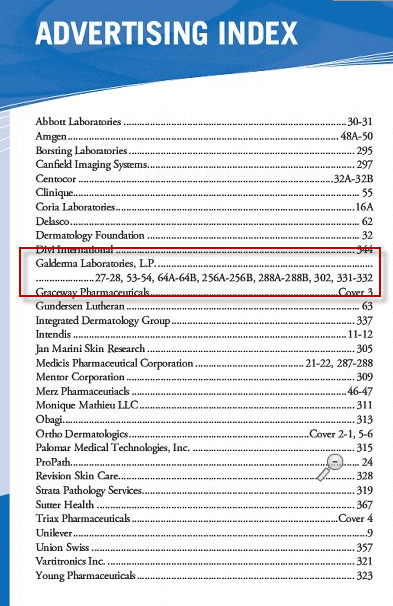 Galderma is one of the major sponsors of the National Rosacea Society. You can see from the NRS web site, Galderma’s donations enable the NRS to conduct their educational program. Of course Galderma is also developing a product dubbed sansrosa, it calls CD07805/47. If and when this product comes to market, Galderma’s rosacea portfolio will be even more impressive. OK so this is all interesting, but what would you like to see from Galderma ? How would you like to see the deepest pockets in the industry spend their research, development and promotional dollars ? I use both Oracea and Metro Cream and I think they are both great products, and there is obviously a huge need for SansRosa since there are not many options for permanent burning redness and flushing. However, I think most people who suffer from rosacea would rather see them putting money into a cure instead of excessive advertising. I’d personally like to see them get behind the research and products that GlycoMira or Dr. Gallo’s lab in San Diego are developing. It is odd that you wrote this article on Galderma because Galderma Canada contacted me in February and asked if “the RRDi [would] be interested in educational partnerships with Galderma.” We sent a letter to Galderma years ago and was totally ignored. I replied the RRDi is interested but haven’t heard anything as of this date. From your excellent articles on Oracea I discovered that the New York Times reports that sales of Oracea for the first half of 2006 totaled $9.1 million and that if you are ‘reading the graph right’, Oracea prescriptions numbered 1.2 million a month in December 2007. Oracea sales was worth approximately $104 million for the twelve-month period ending July 2009. This figure is up almost 200% from the previously reported sales of $52.5 million in 2007. You can imagine how much Oracea sales were for 2009 and will no doubt be reported soon. As far as I know there hasn’t been any studies showing the long term effects of Oracea longer than nine months which is something that needs to be done. Also there aren’t any studies comparing Oracea to low dose doxcycline or low dose Doryx which is another study worth pursuing. There are plenty of studies comparing metronidazole. If the RRDi receives any ‘educational’ grants from Galderma we will be able to use the majority of the funds for actual rosacea research that we choose and we listen to rosacea sufferers. If Gallo research is what is called for then so be it. There may be some novel research that needs to be pursued besides Gallo. Anyway, I certainly enjoyed your article you wrote here about Galderma. Your editorial on this subject is quite interesting. I have been using Soolantra at night and Doxycycline 50 mg. for 6 months now, I have to bump up to 50 mg. doxy twice a day if I get those deep cyst type P&P. It does work. I have also eliminated extra sugar (cookies, cake etc..) no alcohol, been eating raw sauerkraut for mega probiotics (gut flora) and mega dose of vitamin C from raw fermented saurkraut as well some people may not tolerate fermented foods but I can through years of trial and error. I am also taking Rosadyn twice a day and zinco tinted sunscreen (very thin layer) and I am waiting for my order of DML moisturizing lotion in the mail. I am not promoting anything just giving specific info to those who are looking to try my regiment. I am not being paid just trying to help. This may not work for everyone so good luck. I am still having issues with skin texture on my nose so if anyone has a fix I’m all ears, I’m hoping the moisturizer will help. « Dermalogica Close Shave Oil, it really works !